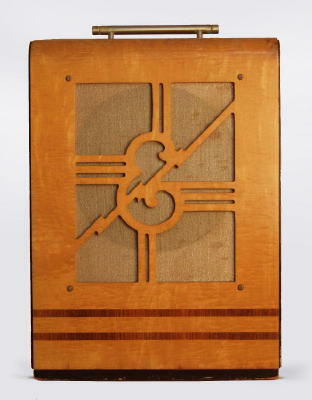 Epiphone Electar Zephyr Model Tube Amplifier, c. 1940, made in New York City, natural maple finish, laminated maple case. This amp was Epiphone's big blonde baby from just before WWII, a thoroughly professional model cased in sparkling maple with a cutout script "E" logo grille. This was a powerful amp for its day with a smooth warm tone that turns to furious overdrive when cranked. Designed by future Danelectro maven Nathan Daniel, The electar Zerhyr was one of the best professional quality amplifiers of the 1940's, and a great gigging amp in the 21st Century. Height is 24 in. (61 cm. ), 16 in. (40.6 cm.) width, and 9 1/2 in. (24.1 cm.) in depth at deepest point. Very nice, all original condition-some dirt and wear overall but really a super example of this model. This is the nicest Electar Zephyr we have had. Generally Excellent Condition.